Ted Lawson was born on March 7, 1917, in Fresno, California. He enlisted in the Aviation Cadet Program of the U.S. Army Air Corps on March 26, 1940, and was commissioned a 2d Lt and awarded his pilot wings on November 15, 1940. His first assignment was as a B-18 Bolo and then B-25 Mitchell pilot with the 95th Bomb Squadron of the 17th Bomb Group at McChord Field, Washington, and then at Pendleton Field, Oregon, from November 1940 until he was selected for the Doolittle Mission in February 1942. Lt Lawson was the pilot on the 7th B-25 to take off from the aircraft carrier USS Hornet (CV-8) on April 18, 1942, and after bombing its assigned targets in Tokyo, the crew crash landed off the coast of China. 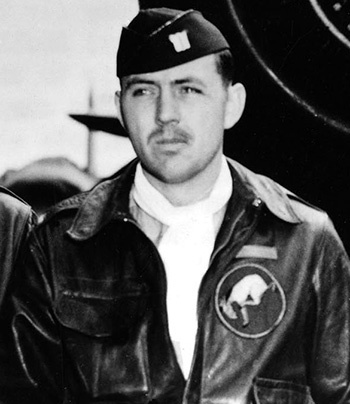 Lt Lawson was seriously injured in the crash and Lt Thomas White, a flight surgeon that participated in the raid as a gunner on the 15th B-25 on the raid, was forced to amputate one of his legs shortly after the crash. After returning to the United States and being treated for his injuries, Maj Lawson served as a Liaison Officer with the U.S. Air Mission to Santiago, Chile, from May 1943 to April 1944, and he was medically retired from the Army Air Forces on February 2, 1945. While he was recuperating in the United States, Lawson wrote the book "30 Seconds Over Tokyo" which was made into a movie by the same name in 1944. Ted Lawson died on January 19, 1992, and was interred at the Chico Cemetery Mausoleum in Chico, California. For extraordinary achievement while participating in a highly destructive raid on the Japanese mainland on April 18, 1942. Lieutenant Lawson volunteered for this mission knowing full well that the chances of survival were extremely remote, and executed his part in it with great skill and daring. This achievement reflects high credit on Lieutenant Lawson and the military service. 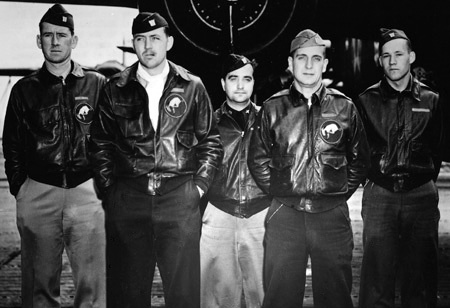 Crew 7 of the Doolittle Raiders, Left to Right-Lt Charles L. McClure, Lt Ted W. Lawson, Lt Robert S. Clever, Lt Dean Davenport, and Sgt David J. Thatcher.